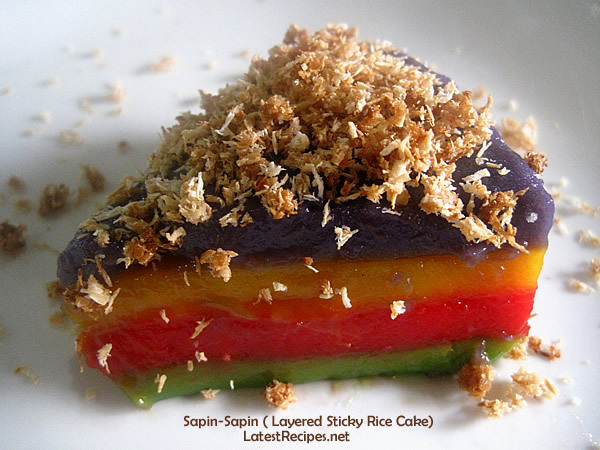 Sapin-Sapin is a Filipino multi-colored (and flavored) layered sticky rice cake. It’s traditionally made of galapong (sticky rice dough) mixed with coconut milk and sugar which is then divided typically into 3 parts; purple yam, pureed corn are usually added to make the purple and yellow layers respectively, then the third part is just left plain. 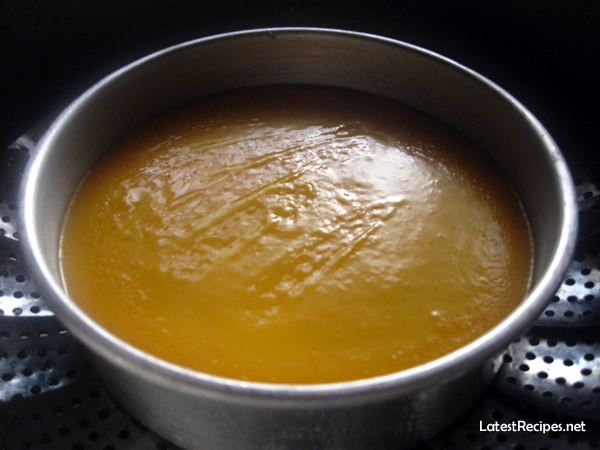 Each layer is steamed until firm before the next one is added, when ready to serve it is topped with either latik or toasted, sweetened grated coconut. It’s very time-consuming to make sapin-sapin,it’s something that most people would rather buy from stores than to make at home. Imagine before, to make sapin-sapin you have to start from making your own galapong (sticky rice dough) extract coconut milk, cook ube (purple yam) jam, it would take forever (for me especially) to finish. Thankfully, there is an easy way to make this now- by using glutinous rice flour and food color and flavorings-from there it’s just a matter of mixing the batter and dividing it and adding different colors to make layers-as many layers as one wishes. The recipe below is adapted from this cooking video. Make the sapin-sapin; you can make your layers in any order..I like the green layer – which is flavored with pandan extract -at the bottom, so it’s the first to cook. yellow, also with just food color..
then last is the purple layer to which I added ube (purple yam) extract. Cool sapin-sapin first before cutting into slices, top with either latik or toasted desiccated coconut. 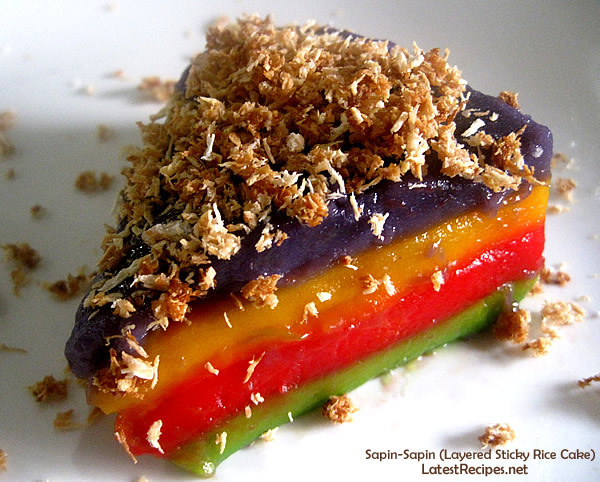 Sapin-Sapin is a Filipino multi-colored (and flavored) layered sticky rice cake. It's traditionally made of galapong (sticky rice dough) mixed with coconut milk and sugar. Make the latik first if using. Combine all ingredients in a bowl except for the food color and flavors. 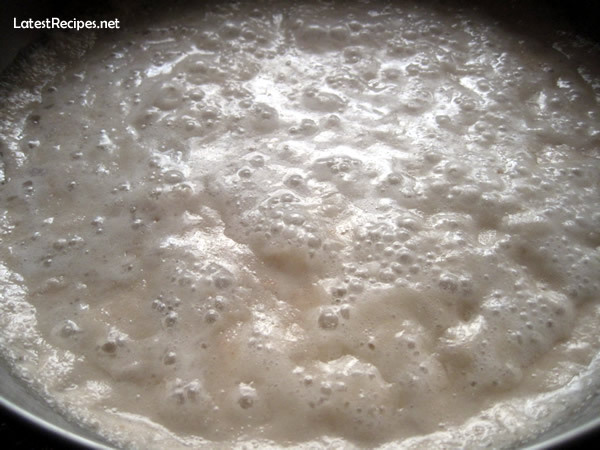 Divide mixture into 3 or 4 separate bowls. Add a food color/flavor into each portion. 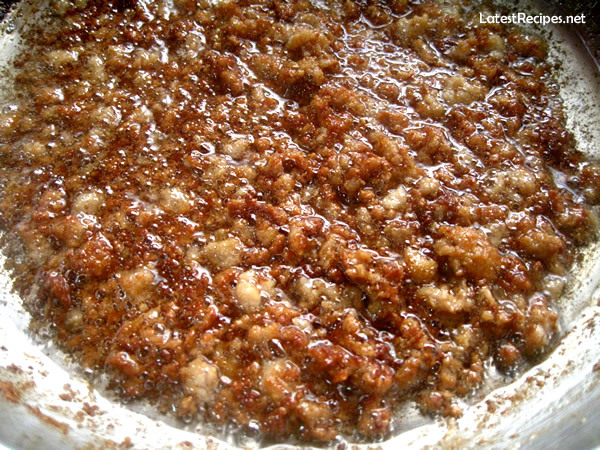 Grease a 7 inch or 8" inch pan with coconut oil. 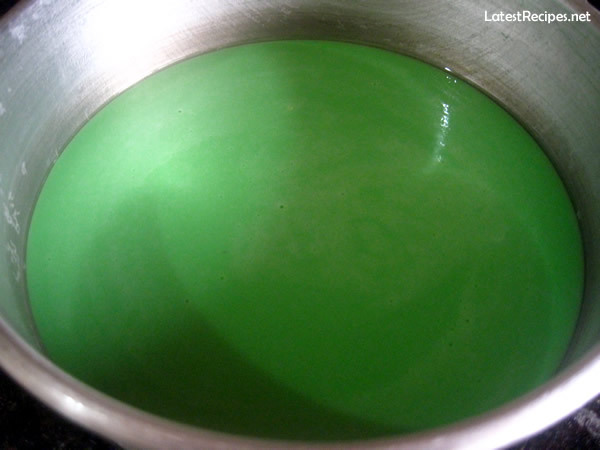 Pour the pandan flavor into the pan; cover loosely with foil and steam until set. 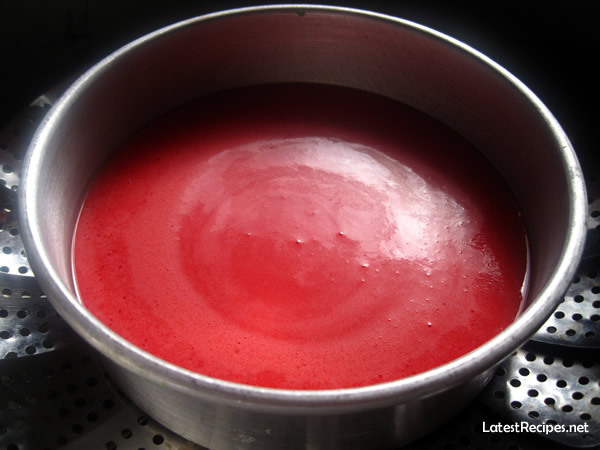 Brush top with a little coconut oil and pour red mixture, put the pan back in the steamer and steam until mixture sets. Repeat until all batter are used up. Turn off heat and leave pan in the steamer to cool a bit then take out pan to completely cool sapin-sapin. 2 Responses to "Sapin-Sapin (Layered Sticky Rice Cake)"